Professional lock bypass tool operates latches directly through the gap between a door and door frame. Push, pull, or slide to open doors. SKU: SJ-50. Category: Locksmith's Tools. Brands: SouthOrd. A simple lock bypass tool that works on many different types of locks. Slide the device into the gap between the door and frame to operate the latch directly. Think of this as the old credit card bypass trick for the professional. Tool design allows for pushing, pulling, or sliding latches. 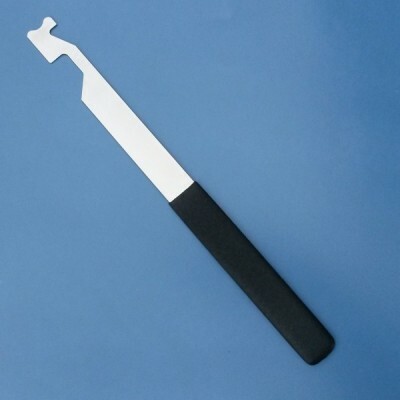 Flexible steel blade with rubberized handle. 10″ long and 3/4″ wide. NOTE: U.S. Postal Regulations prohibit shipping lock picks, lock bypass tools, or impressioning tools by US Mail. These items must ship by UPS. Therefore, we are not able to ship this item to PO Boxes, addresses outside the US, or to APO, FPO, DPO addresses. Maybe my words came off harsher than intended. Alright. Then it is cheap steel as it flexes a lot…much like aluminum would. A stamped part with sharp edges. And it’s made from aluminum. It flexes a lot. We usually just let reviews stand alone without any comments, whether they’re favorable or not. But we wanted to correct an inaccuracy. The Shovit Tool is made of steel. We just stuck a magnet to one to make sure.